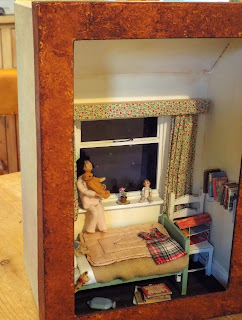 Part Four & Final Part Of Little Cardboard Box Project! 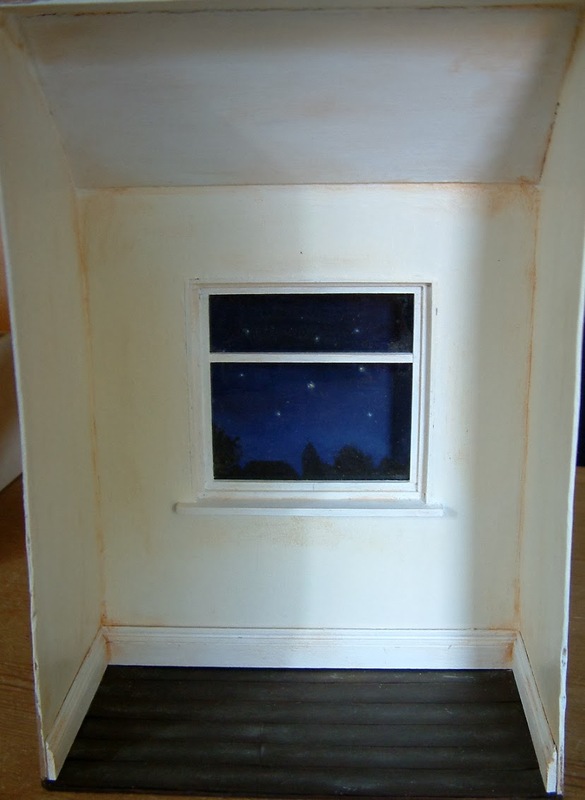 Way back this year, I started working on a project...not a paid for commission this time, but a project situated in a simple cardboard box based on a nursery rhyme theme.....I chose TWINKLE TWINKLE LITTLE STAR. 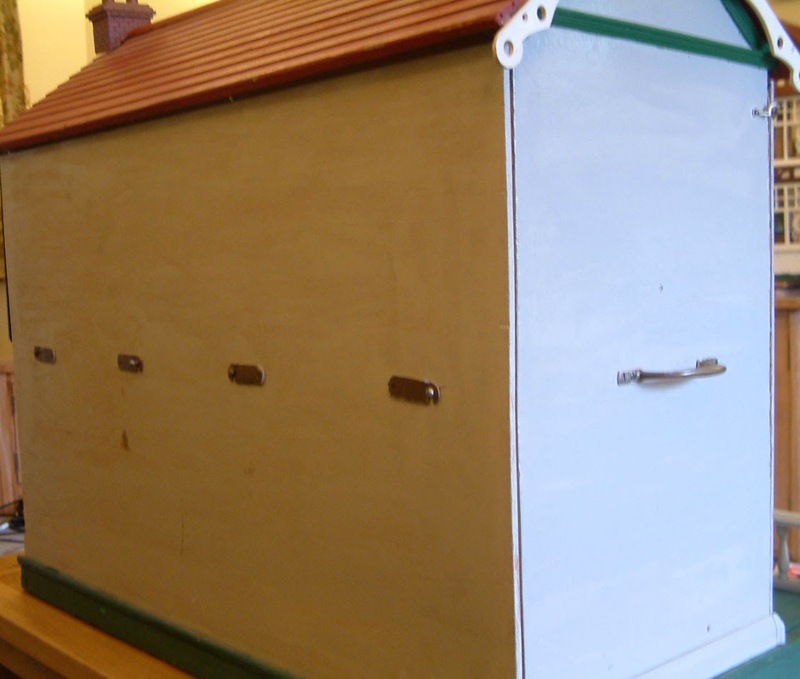 This is a project for our local Thame club, and it was time to complete. 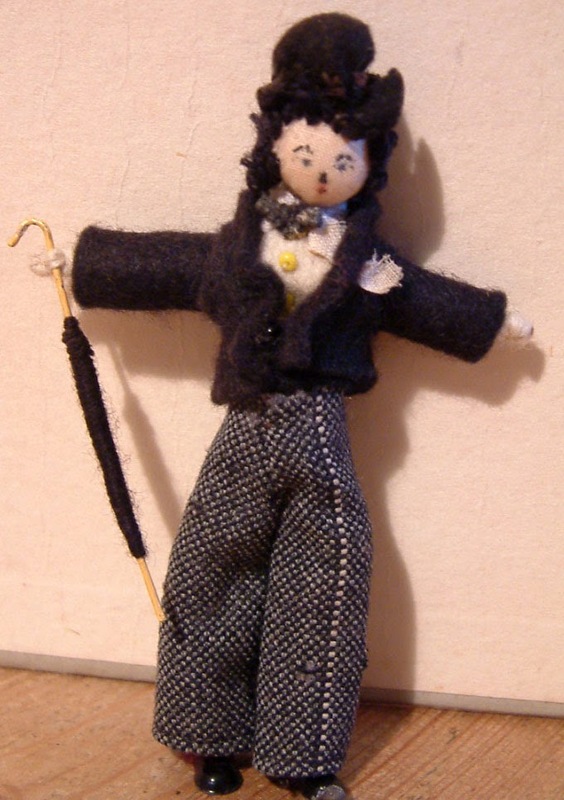 The doll was specially made for me by my mate Robin Britton of Coombe Crafts. 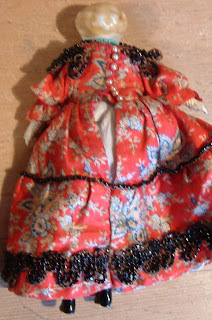 Her character dolls are gorgeous and can be manipulated into different poses. 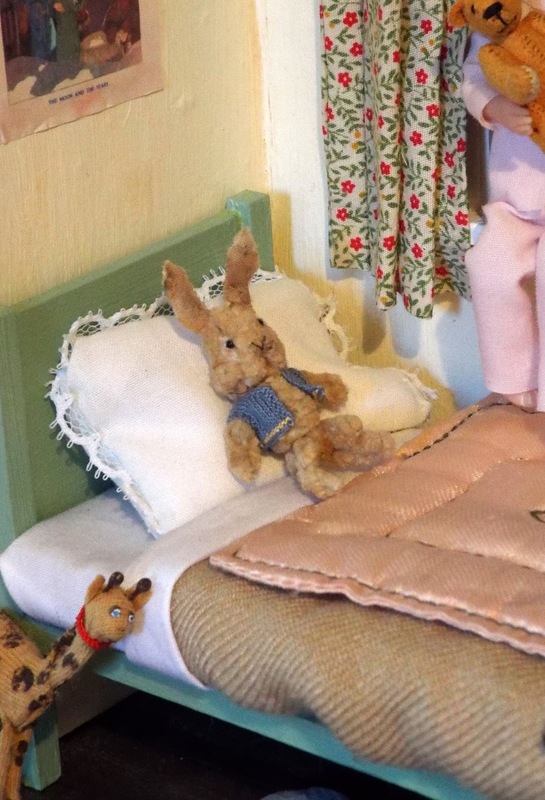 I completely succumbed to these special items....the aged rabbit is by Teeny Tiny Teddies, the jointed teddy was made by Pat Kay, the plant by Jan Southerton and the tiny doll by Janice Crawley. 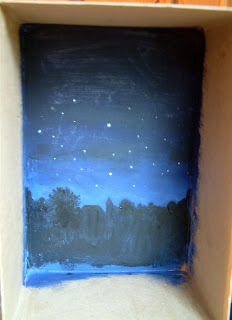 The starry sky does show up better in real life, it is very difficult to photo due to the light, shadows and reflection but am pleased with how it turned out. Haha...I have a bit of a thing for toy giraffes, and Robin gave me her prototype giraffe which she made for our last Nostalgia In Miniature Workshop project, wobbly legs and all....I love him! 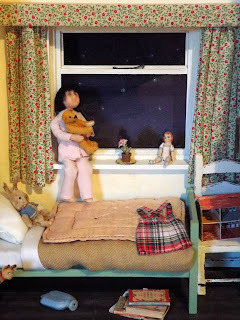 The bed I made from scraps of wood, bedding from scrap material and the pink eiderdown is a vintage Dol-Toi one from Marion Osborne's Collection. The printed dolls house on the aged chair and various children's books on an aged book shelf you will probably have recognised as being made by yours truly...from KT Miniatures. 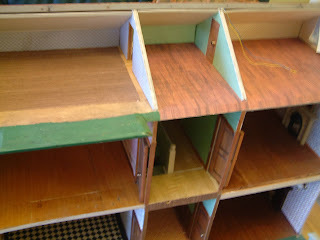 The curtains were easy to do and I have used a combination of double sided tape, Tacky Glue and a pelmet constructed from scraps of wood. 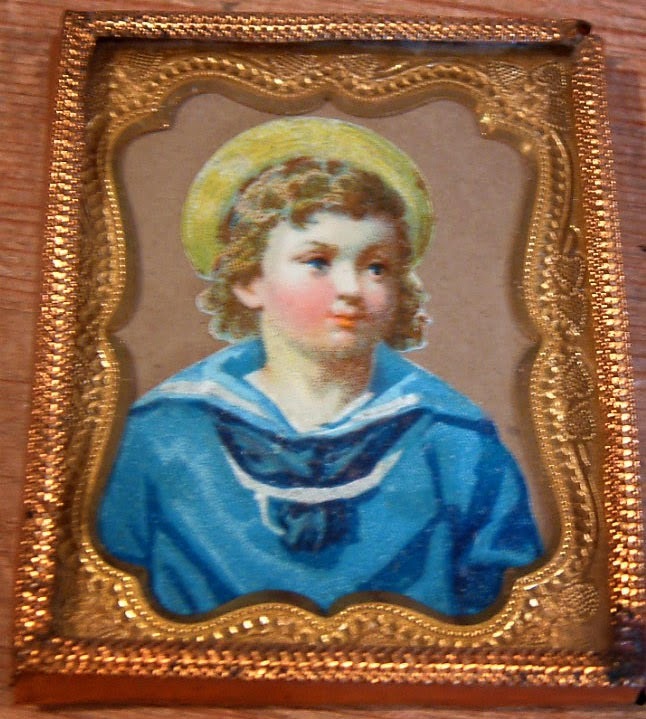 A rectangular piece from the lid was cut out with a sharp craft knife to create a frame, then using a combination of burnt umber and gold acrylic paints, produced a mottled paint effect. I will not cover the rest of the box as this is simply going to sit on a shelf. 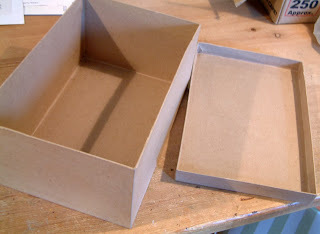 I've plans to insert an acrylic cover inside the frame to keep the dust off, but that will have to wait for another day. I really hope that by seeing this little project, it may inspire you to have a go....after all, this started out as a simple cardboard box! PS. 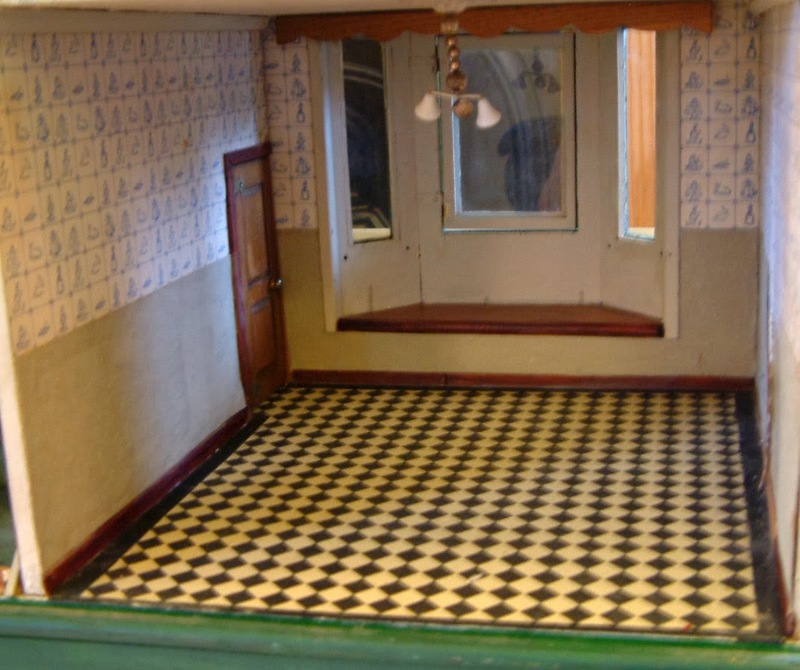 This and other various projects made by members of the Market Town Miniaturists Club (Thame) will be on display at the Thame Dolls House & Miniatures Fair on Saturday 22nd February 2014. 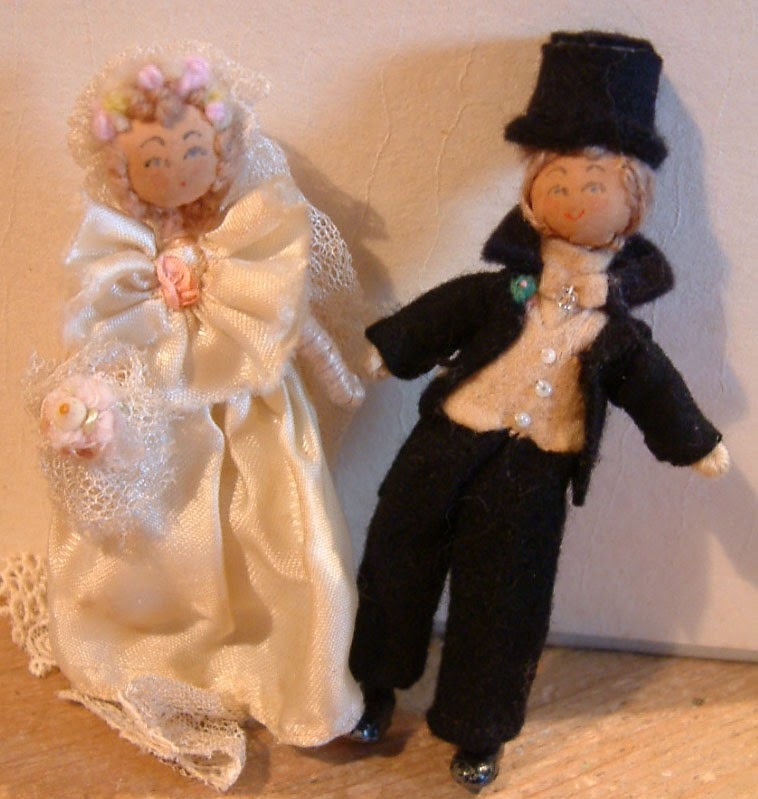 KT Miniatures will be having a stand at the fair. IMPORTANT NOTICE: Due to my main computer crashing over the weekend of October 18th-20th, it appears that recent emails have been lost and unusually, the normal backup did not work either....aaaagh!!!! However, my IT Director aka Mr KT Miniatures has got the system up and running again (bless his little cotton socks), but if you have emailed me recently and I have not yet responded, can you please email me again. 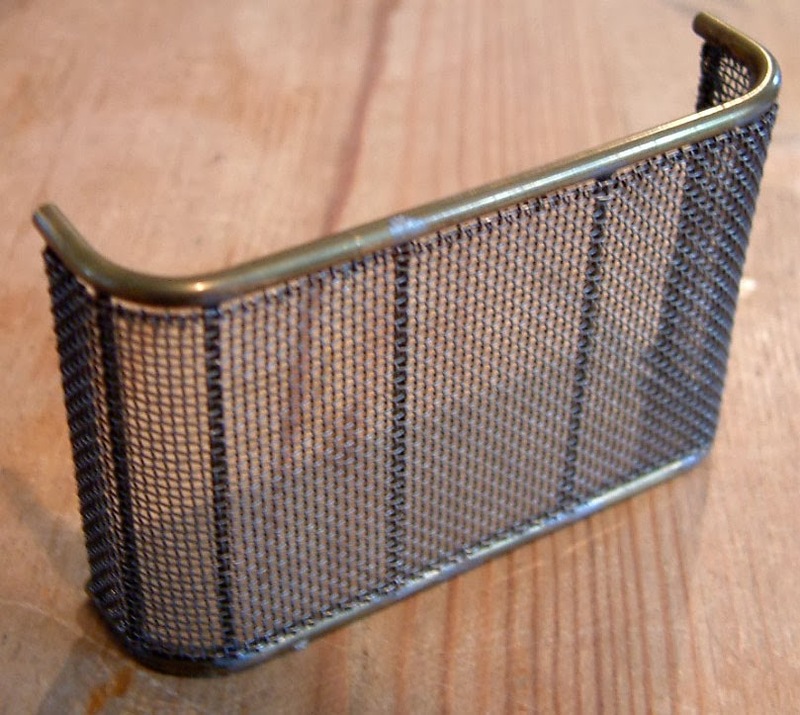 It will mean that your email no longer exists my end! Many thanks and huge apologies for any inconvenience. 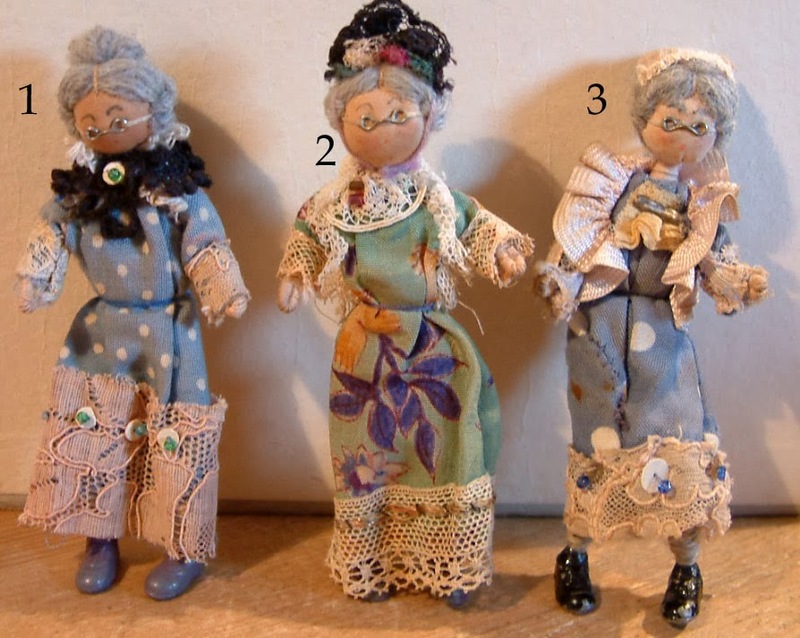 Occasionally I may get the odd one or two Grecon dolls in to sell....very occasionally I may get three or four....but rarely do I ever get in over 50!!!! 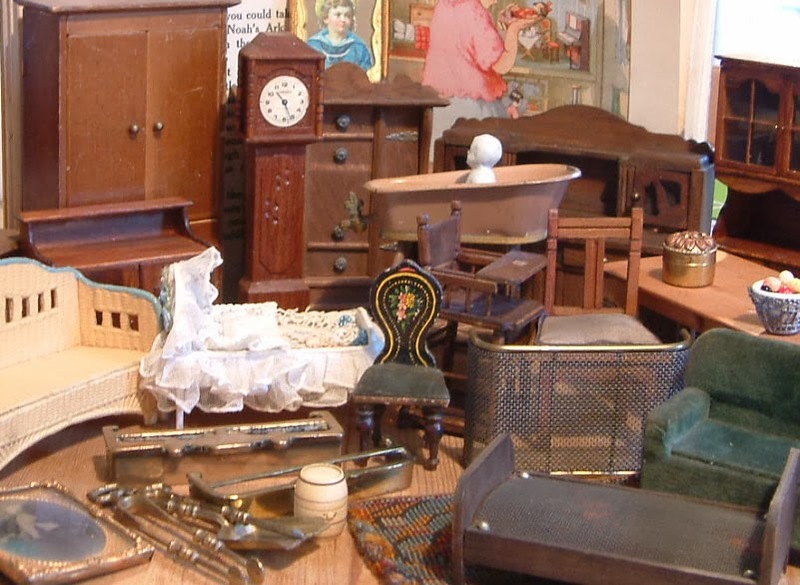 But this amazing collection, amassed over a long period of time with one or two quite rare ones tucked amongst them, have gone up for sale today on KT Miniatures. 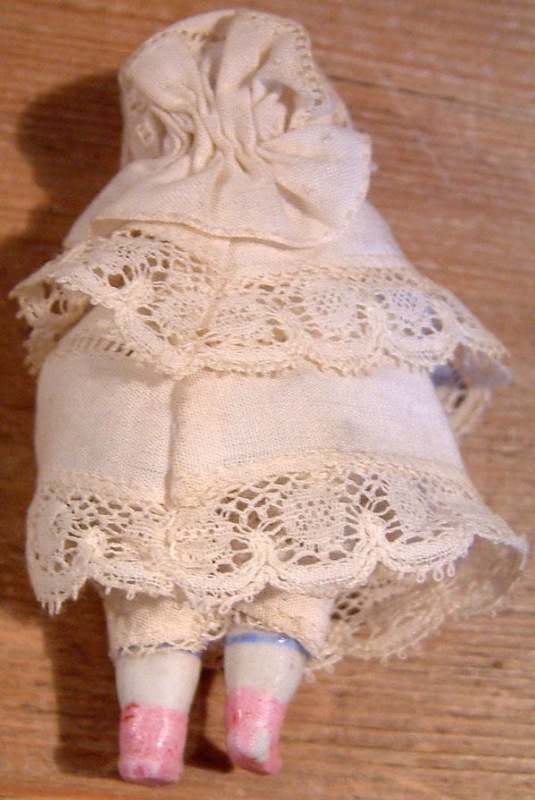 For those of you who are not familiar with Grecons...........they are dolls made with wire frames, bound in wool which are fixed to stuffed material heads. They usually have woollen hair (artificial hair in later years),drawn on facial features, painted lead feet, material clothes and various embellishments. 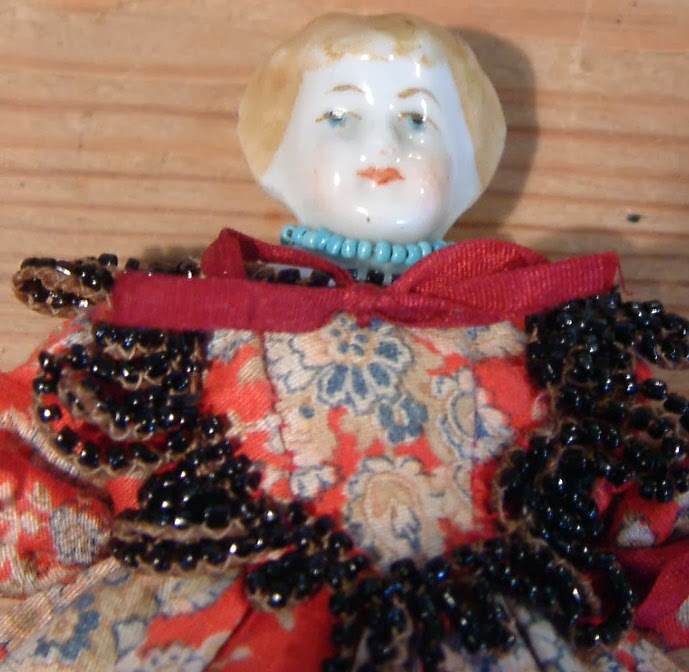 You could bend their limbs into all kinds of positions and have been popular since Miss Cohn started making them back in 1936, and continued to do so for many years until the 1980s. 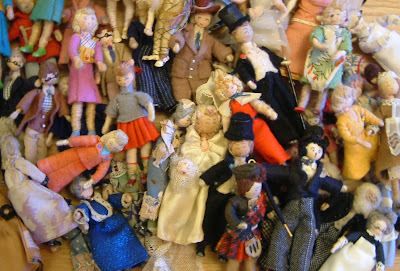 This collection of dolls have been much cherished and collected over many years. They belonged to the mother of the previous owner. 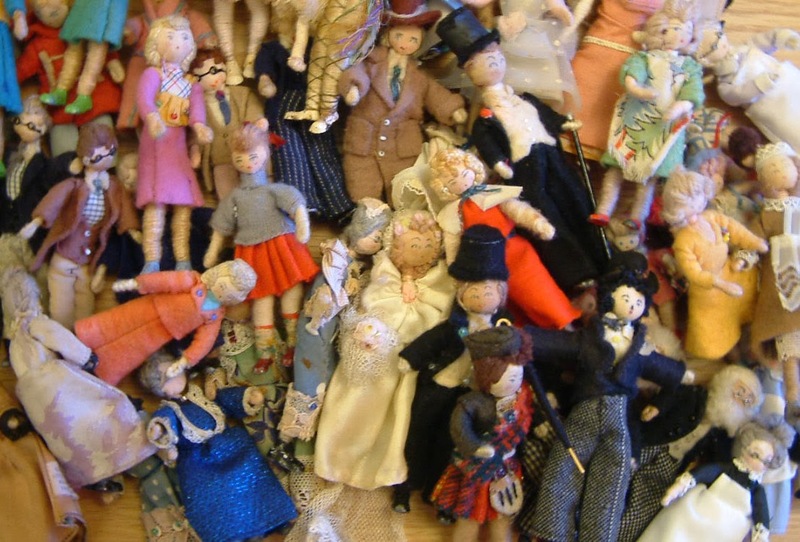 But now it was time to find a new home for each and every single one of them. 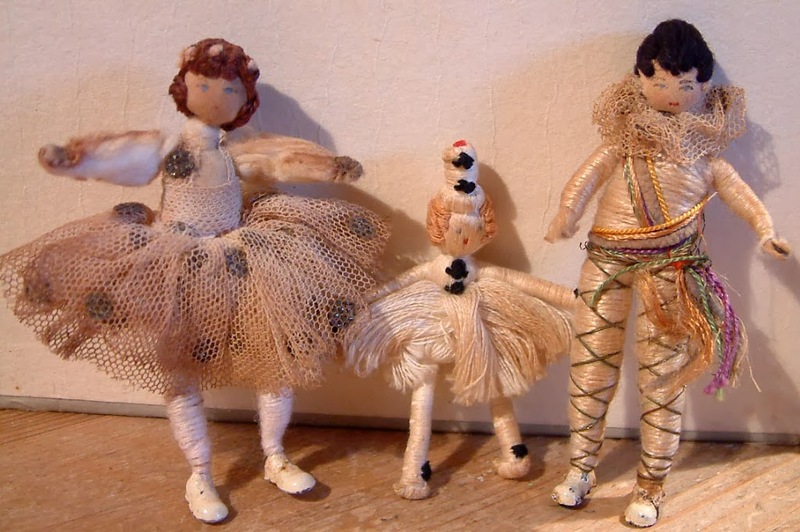 One of the most rare amongst the collection is this set of three dolls....characters called Columbine, Clown & Harlequin from the traditional pantomime story! Columbine the dancer has the most exquisite sparkly embellishments on all four layers of her tutu....and Harlequin's costume is amazing seeing it has simply been made with thread of different colours. And the funny little creature in the middle is Clown. 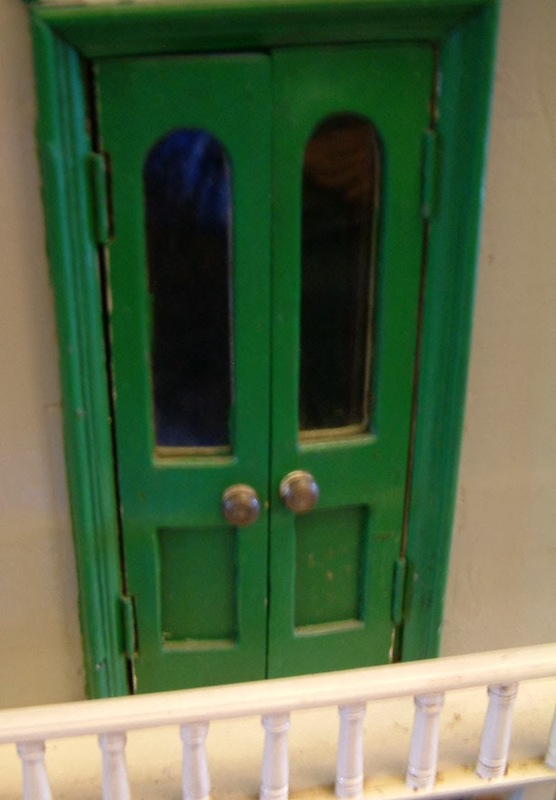 These were bought within minutes of them going up for sale....am not suprised as they are completey unique and I have never set eyes on any Grecons quite like them before. 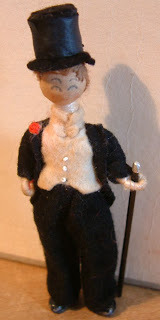 Then there is this very odd but also very rare Charlie Chaplin Grecon....I will accept offers on him. He even has a tiny umbrella fixed to his hand. One of my favourites of all these dolls has to be this posh gent.....he is so handsome in his regalia of top hat and tails......plus unusually he has a walking stick. Another favourite of mine is this Scotsman......with his tartan kilt and sash, and even a felt sporron. 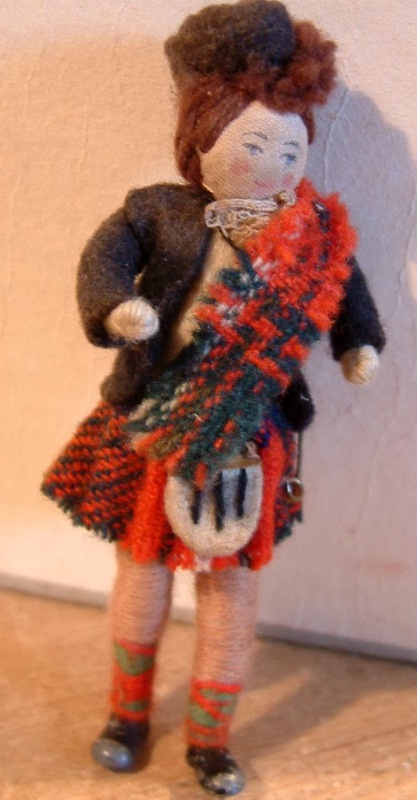 I love his socks.......very cleverly made with a combination of red and green threads. These old grannies just make me smile! 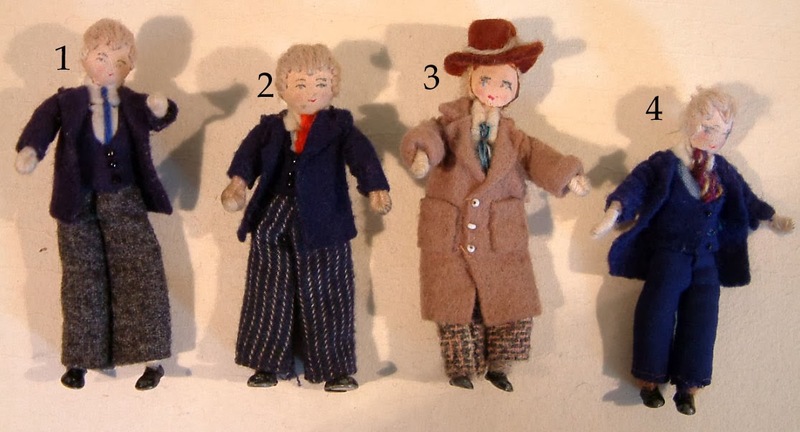 Haha...some of these look a bit shifty...don't you think! 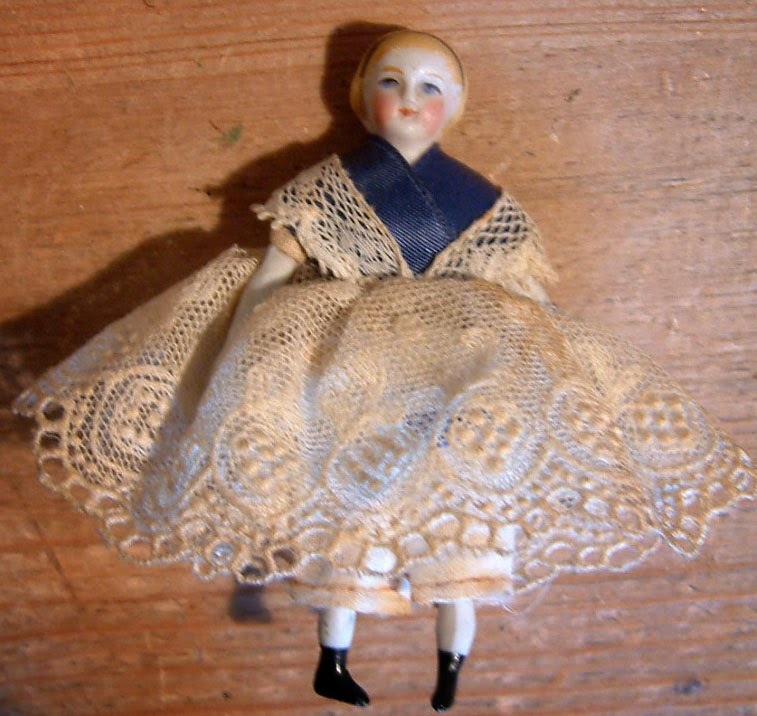 Although many have already been sold or reserved, there are still quite a few Grecon dolls still available. 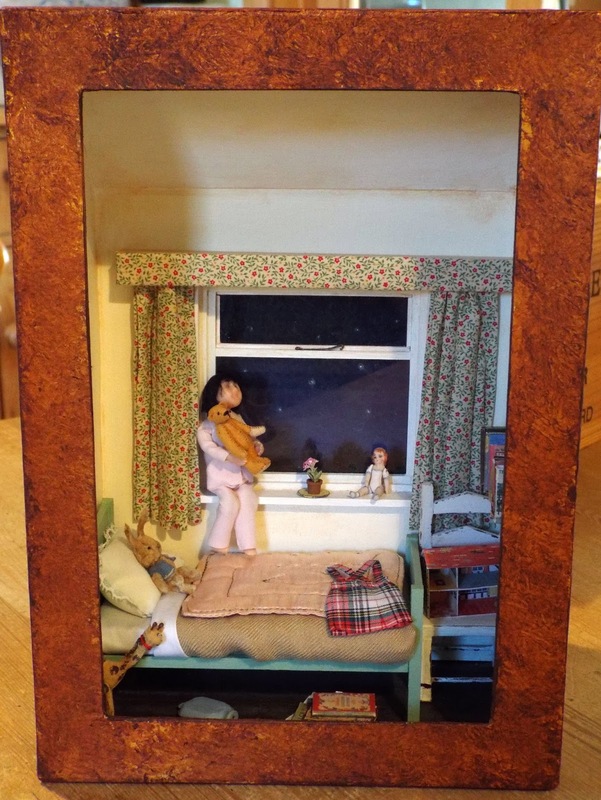 circa 1910 Dolls House...With A Provenance Including Brass Plaque! 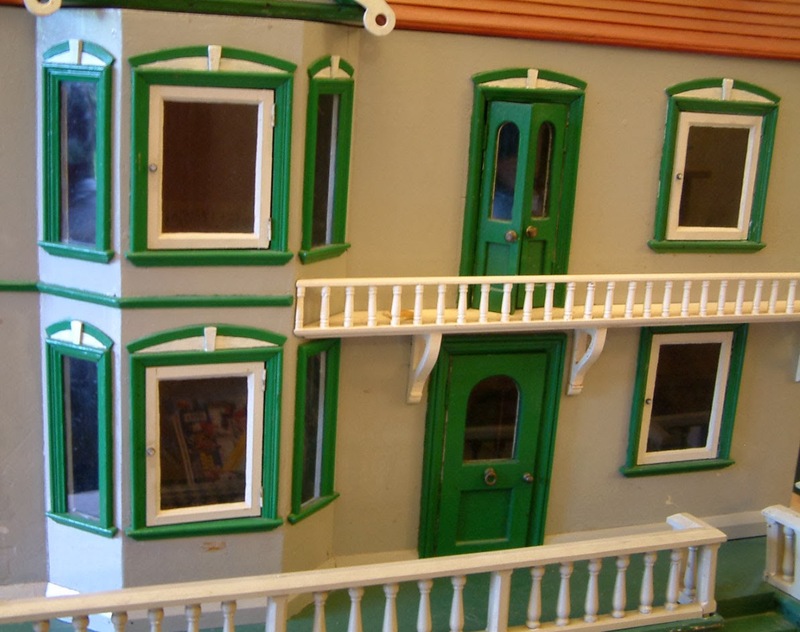 Another gorgeous dolls house has come into KT Miniatures and is now up for sale. 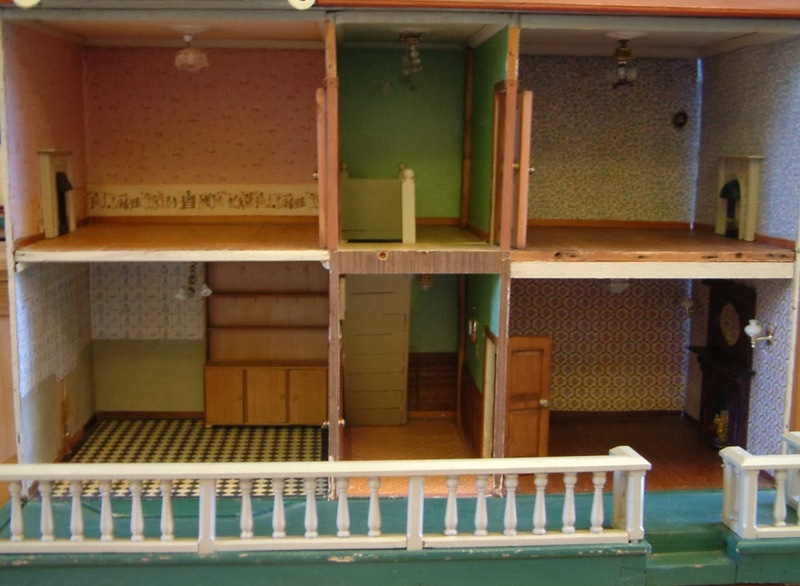 It is not often a dolls house actually arrives with a written provenance these days but this house did just that! 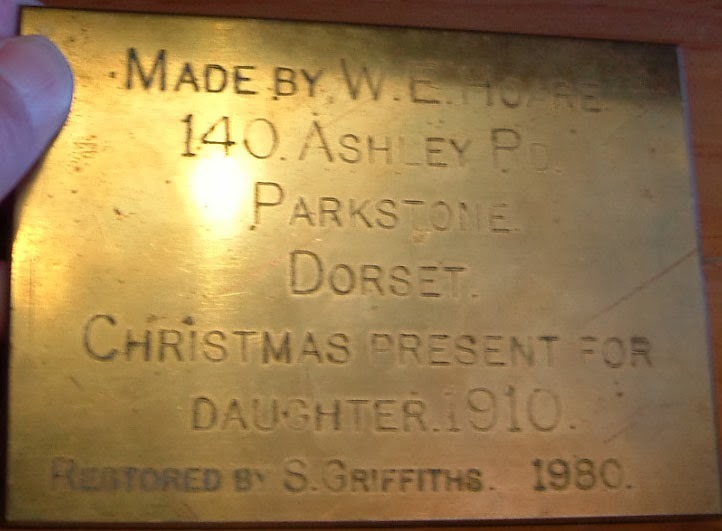 But not only that, this little treasure comes with it's very own engraved brass plaque too.........how fantastic is that!? This brass plaque says it all really, doesn't it? 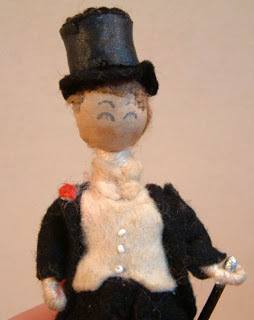 Mr W.E. 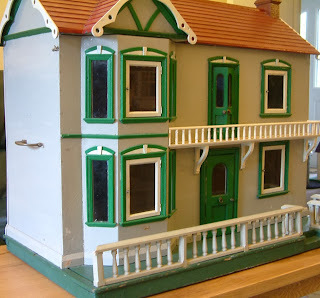 Hoare of Parkstone in Dorset made this house for his daughter at Christmas in 1910. Mr Griffiths restored this for his wife in 1980. 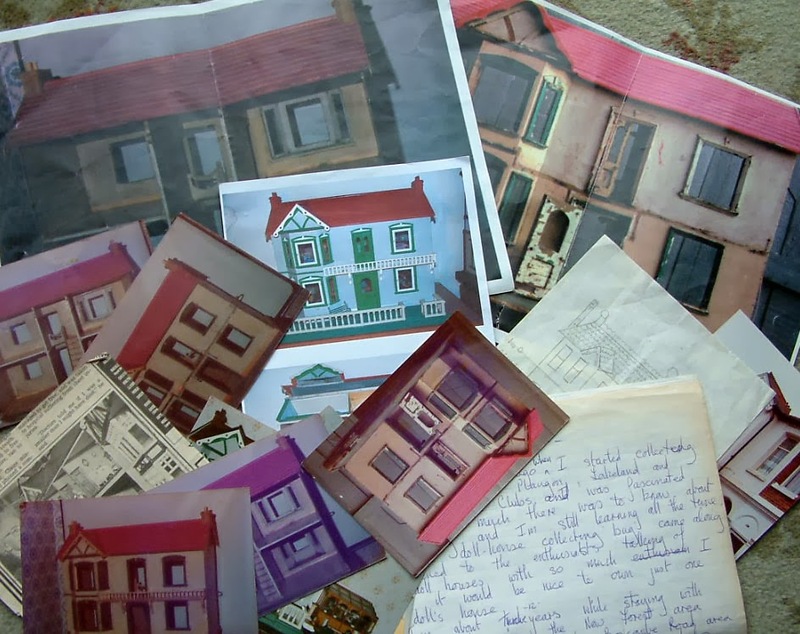 There are umpteen photos and photocopies of images before and after restoration by Mr Griffiths in 1980. Plus Mrs Griffiths has left a handwritten account of how she bought this house from a junk shop in Boscombe, Bournemouth in the 1970s.....and how in 1980 her husband lovingly restored it and even put electricity into it. 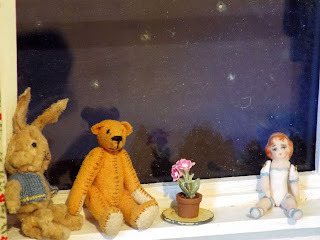 The 1980 decor and lights still remain in place but whether the lights still work or not, I don't know. 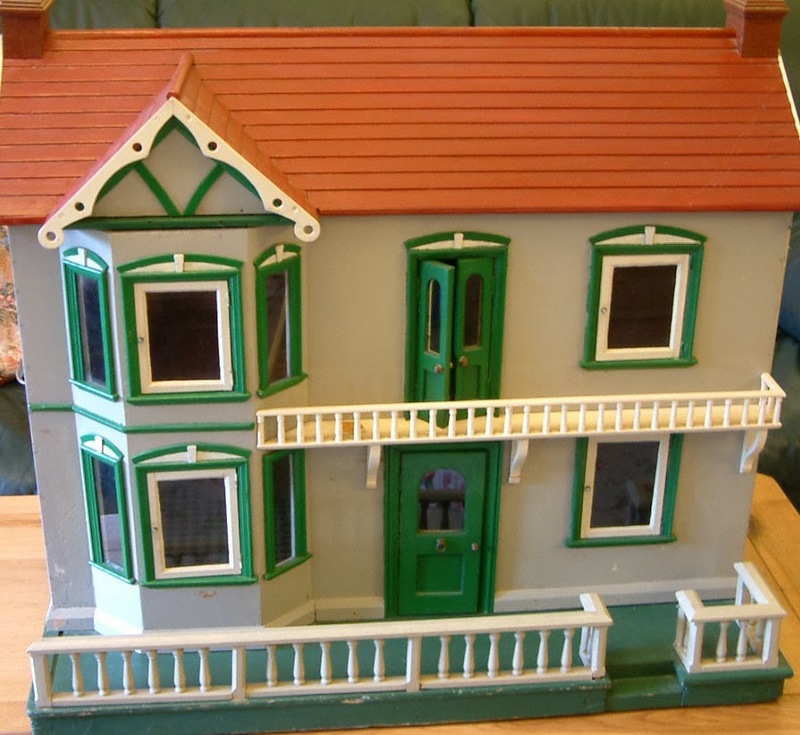 Mrs Griffiths tells us that when she first got it, it was back opening but because she loved the front so much, she got her husband to put a back on and open up the front instead....which he did! 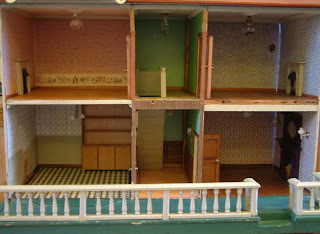 In the above photo, you can see the interior of the house, as viwed from the front. 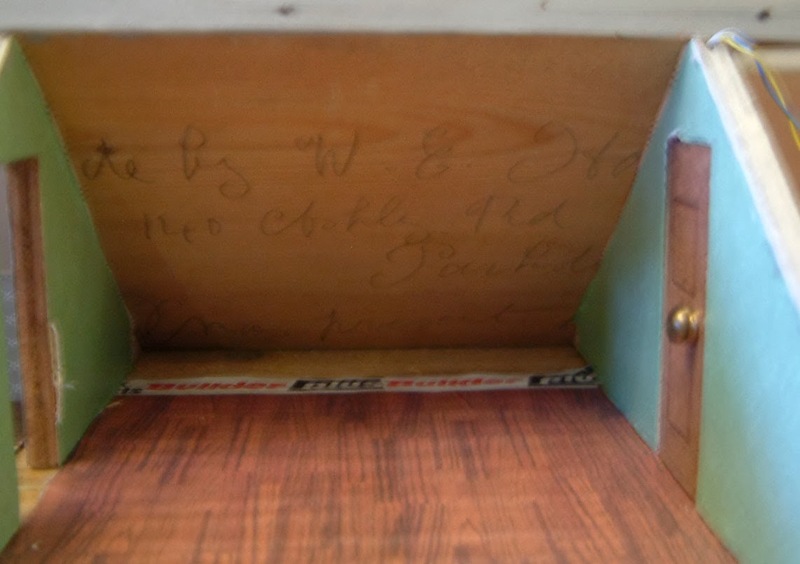 When Mr Griffiths opened up the roof in order to get the frontage off, he was amazed to find a handwritten message on the inside back roof panel from Mr Hoare, the maker, stating that he had made the house for his daughter for Christmas in 1910, along with his address....isn't that brilliant! So, Mr Griffiths decided that now the roof was open, he may as well make good use of it and created three further rooms but left the central piece loose so that it could be unslotted easily if anyone wanted to read the handwritten message....very clever! It does make me wonder how many other handwritten messages by a doll house maker there are, yet to be discovered hidden inside the fabric of our old dolls houses? 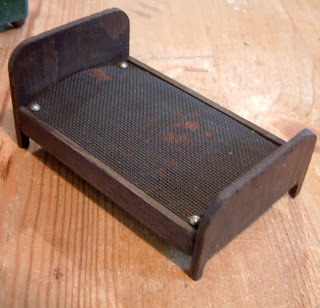 But just look....Mr Griffiths thought of everything!! He very cleverely created four sliding latches on the back panel so that the back wall could be completely removed in seconds...then put back into place if needed, just as easily. 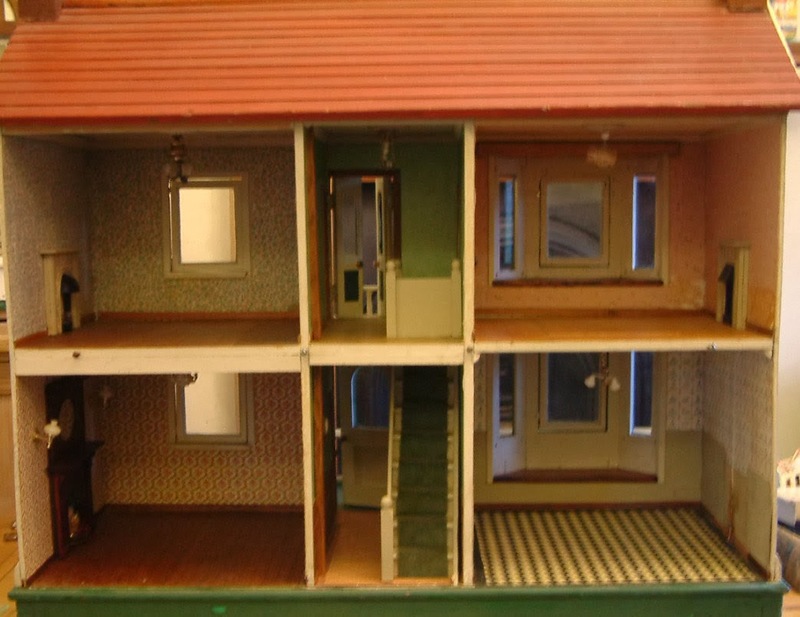 This is the interior view from the back, which I much prefer than the front interior view, because you can see the beauty of the bay windows from the inside and more importantly the actual staircase. 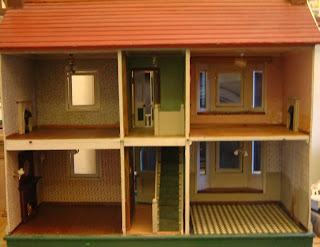 In the above photo you can see the stairs as viewed from the back. 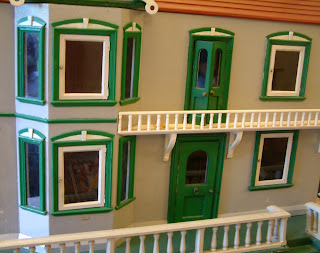 All the interior doors open and on the landing is a lovely pair of opening doors which lead out onto a front balcony. The windows are all glazed with real glass and each main central window panel actually opens. 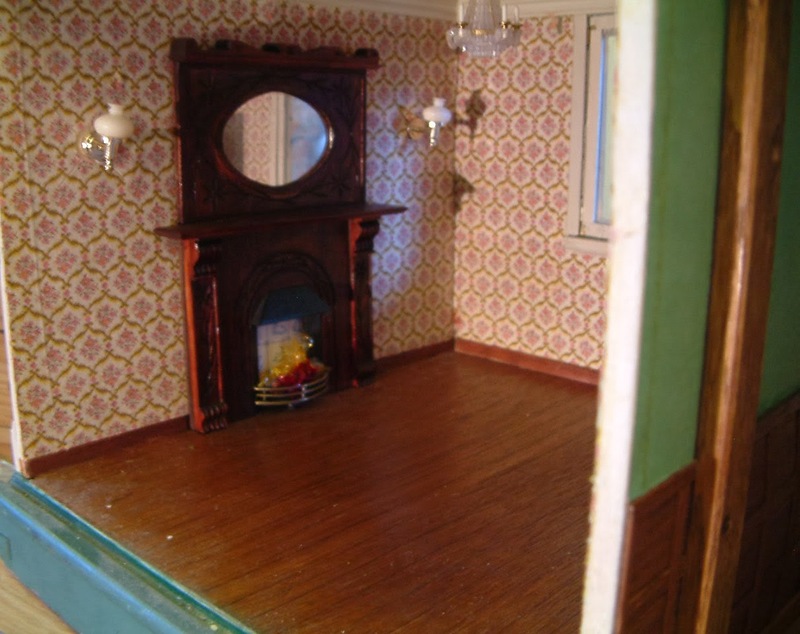 In the lounge is what I believe to be an artisan made wooden fire surround with an over mantle mirror, from 1980. It has been very nicely done. 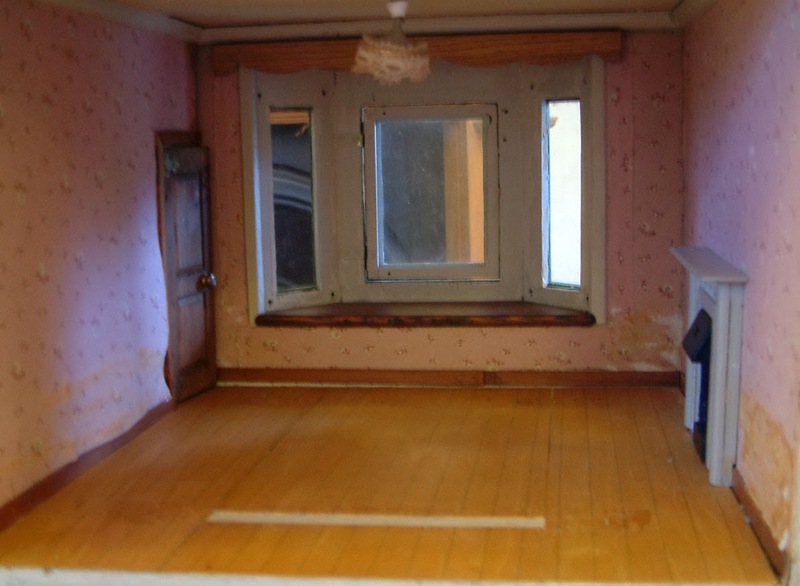 The kitchen, when viewed from the back, has this beautiful bay window with window seat, which could be made into a real lovely feature. This is one of the upstairs rooms.....also with a bay window and window seat. 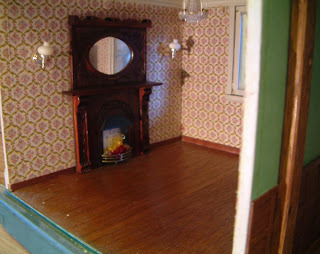 Here is the other upstairs room. 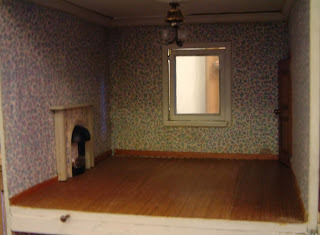 Both rooms upstairs have a fireplace from 1980, the year this house was restored. 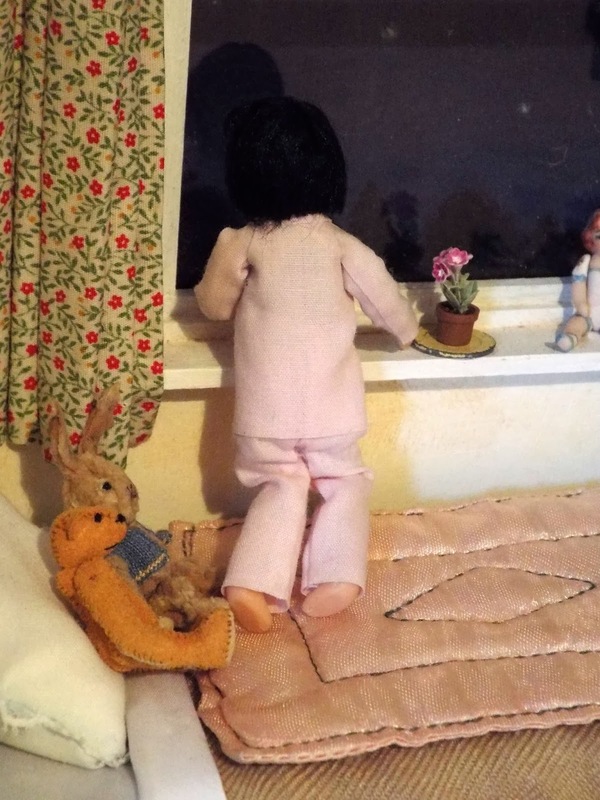 Finally, this ballustrade at the front is not all there...and like a jigsaw puzzle, I have endeavoured to slot pieces into one long run.....there are other bits of ballustrade still present but not enough to make the run extend to the left hand side. 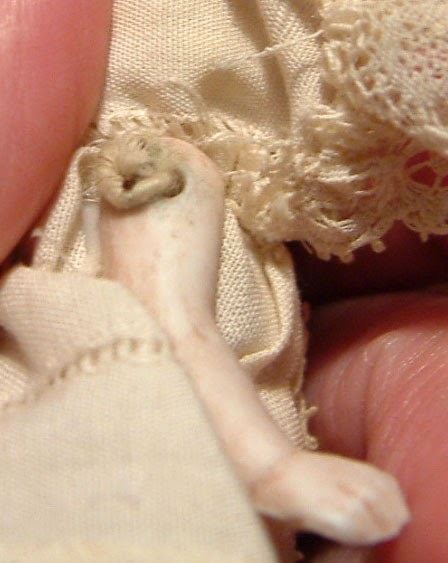 The small bit of ballustrade on the right hand corner is fully intact. However, we understand from Mrs Griffiths that this ballustrade was not actually original to the house but put in by Mr Griffiths.The pieces are not glued in so are easily removed if necessary. 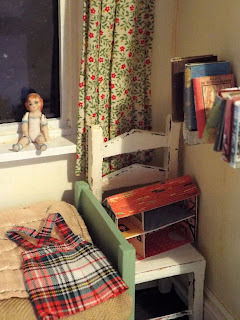 This house has been much loved. 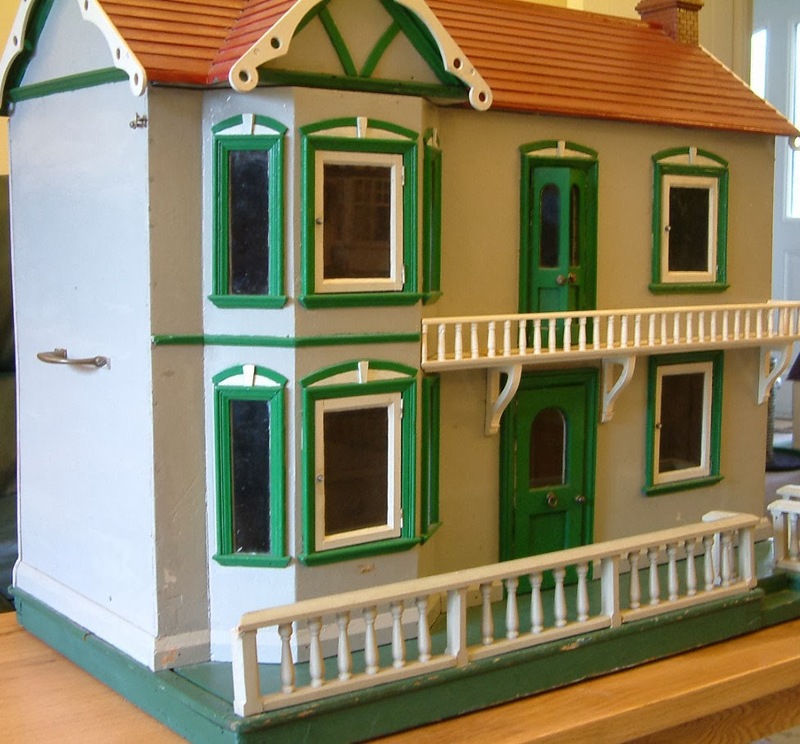 Somehow, this charming house found its way back down to Bournemouth many years later after its restoration and was then handed down through another family where it has been much played with - hence now in need of a new home. 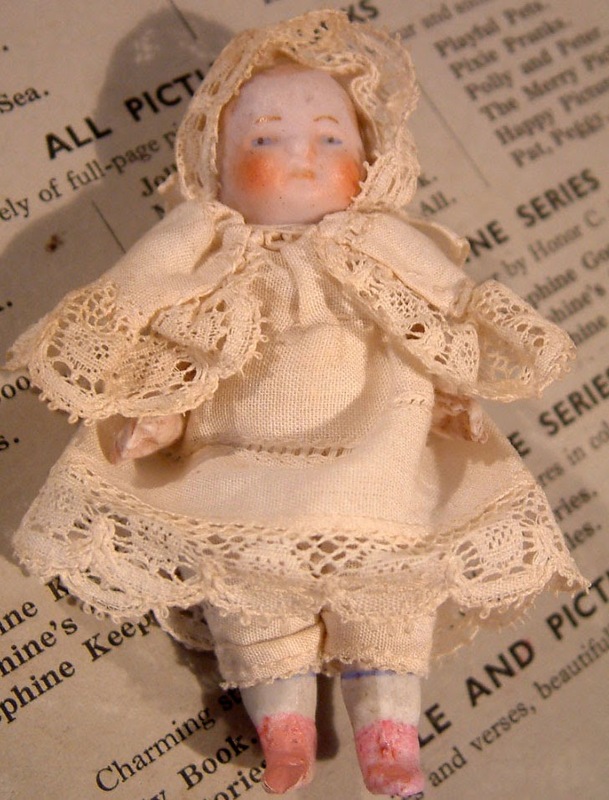 Lots Of Antique & Vintage Treasures Now Up For Sale! Have been extremely busy today, listing loads more wonderful antique and vintage miniature goodies to KT Miniatures. 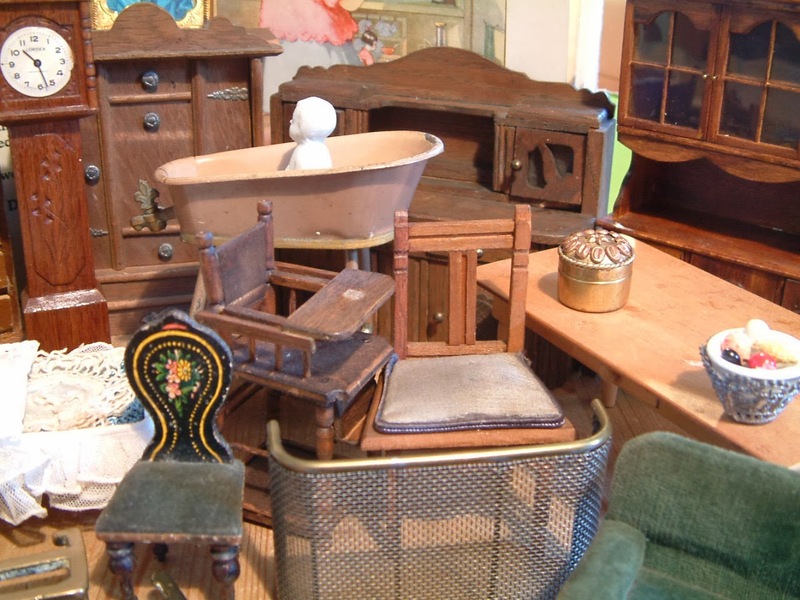 A real diversity of eras, shapes, sizes and prices....ranging from Victorian to not so old. 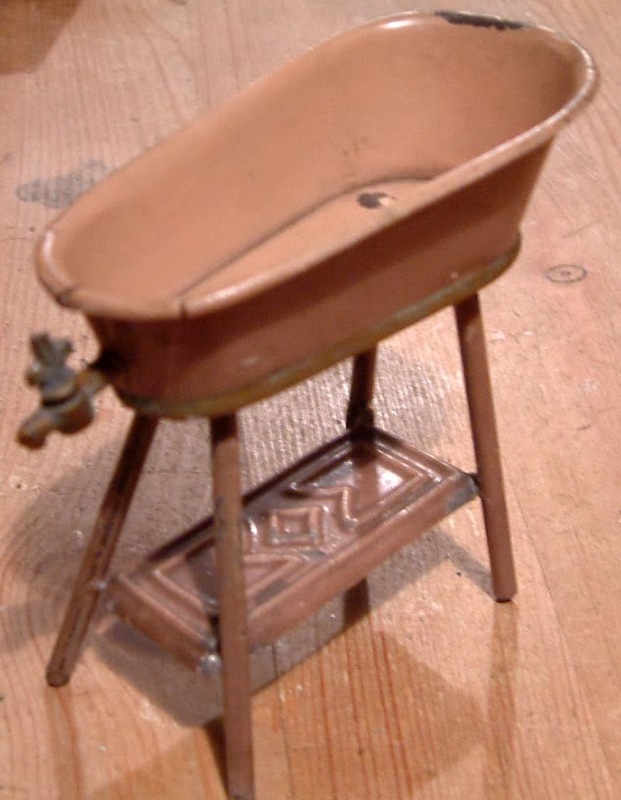 This early 1900s German tin bath on stand just doesn't come along very often. There is a tiny tap at the end with an actual hole inside the bath so I assume that at one time, the tap could be turned on and off and water could be drained out of it....how fabulous is that! 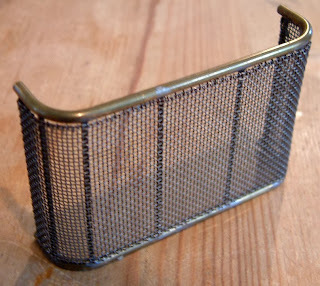 This fire guard intrigues me...have never handled one quite like this before and simply cannot figure out exactly how old it is. 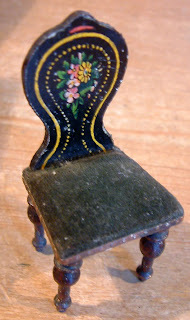 It certainly has some age but not sure if it could be classified as vintage or antique...does anyone recognise it? Then there is this rather lovely Victorian German lithographed seat with green velvet upholstery. 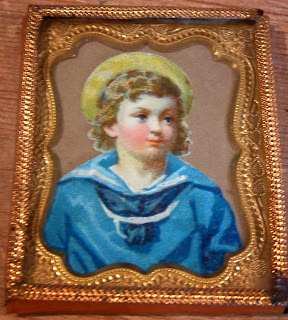 I love this gorgeous early1900s fully glazed and metal frame of a little boy. 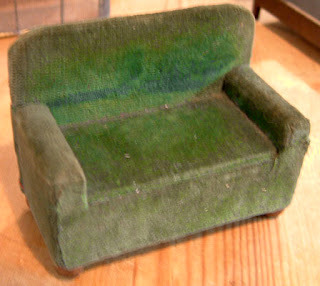 1930s Pit-a-Pat items are always popular....here is a bed & green velvet sofa. All these and a lot more can be found on the various antique and vintage sections on KT Miniatures. 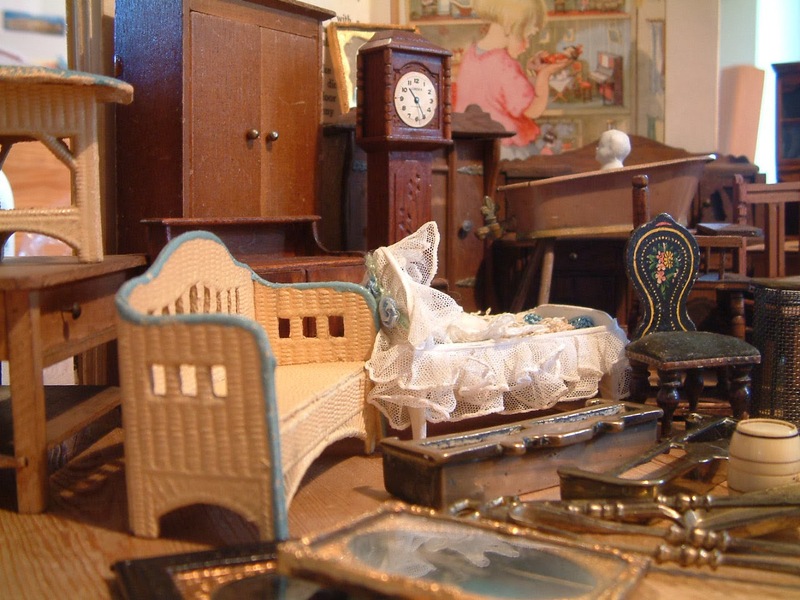 If you click on the following link, it will take you through to the main Antique & Vintage Index Page. 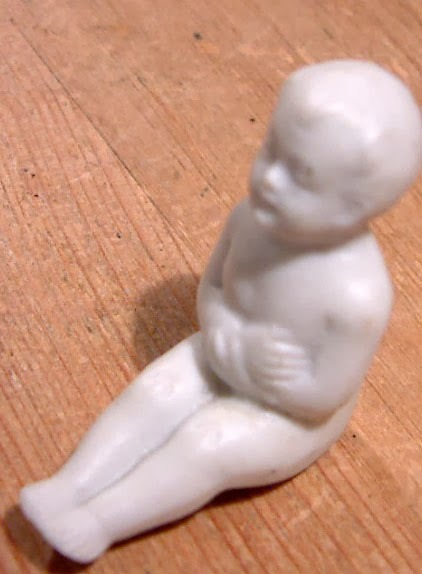 This little antique German bathing figure is another piece that doesn't come along very often and is very nice indeed. Would look fantastic in the German tin bath of the same era (as seen in the photos above). 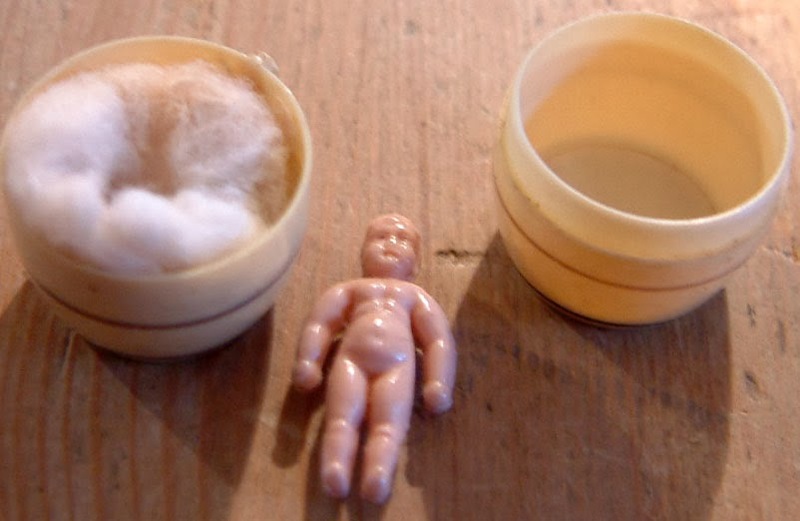 I must confess, I had this for a while before it occured to me that it may unscrew......look what I found inside! After a little bit of research I discovered that the barrel is celluloid and was available during the 1930s. 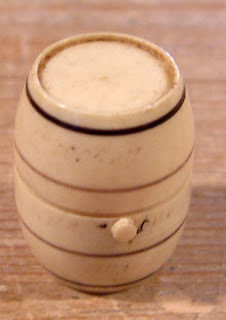 The little doll inside is original to the barrel and on the outside it should read in black lettering......."The Smallest Bathing Doll In The World"....however the lettering has almost completely rubbed off my little barrel. Still...quite a rare little thing. 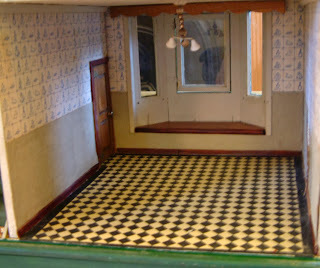 A wonderful antique dolls house c1910 has just come in...more about that very soon. 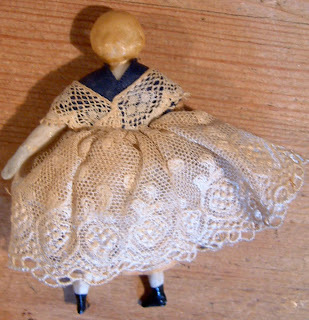 There is this exquisite bisque Edwardian little child doll with movable limbs. 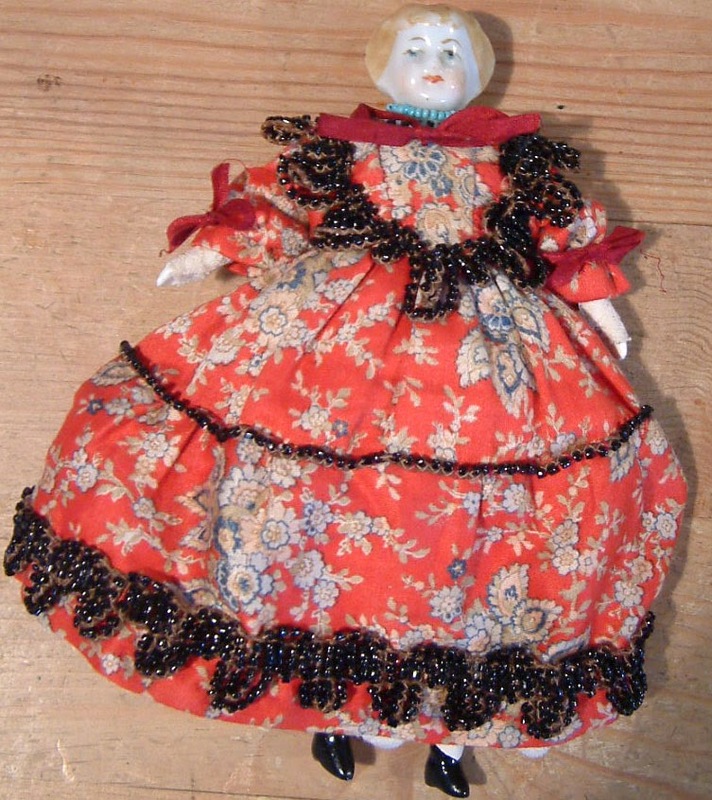 She is marked Germany on the back and appears to be in her original clothes, including bonnet and cape. A really nice detail are the oversewn limb pin heads, presumably to prevent the pin heads chaffing the material? Then there is this teeny bisque doll, believed to be Victorian - her clothes are exquisite and she stands at just 3" high. 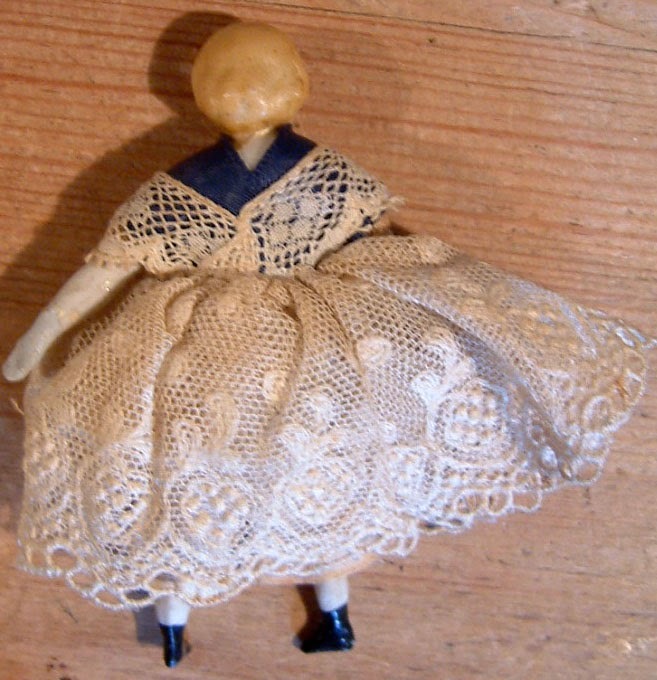 This little beauty is believed to be Victorian, with a china head and arms plus bisque legs. 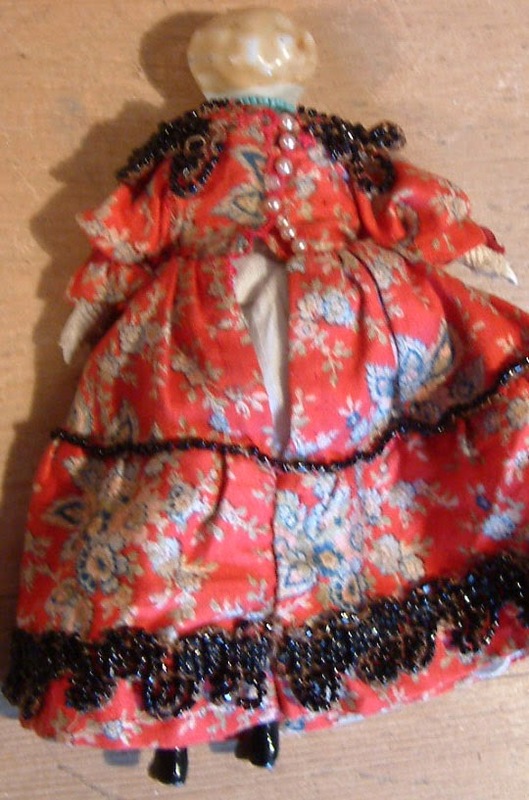 Her beautiful dress is a far more recent addition but even so, it probably has some age to it. 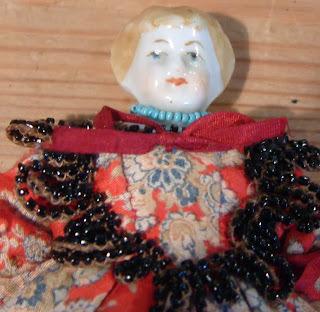 Whoever made this dress must have been an accomplished needlewoman - the prolific bead embellishment as well as the loops that hook over tiny white beads to fasten the back, are simply lovely. 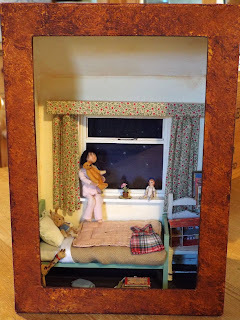 And I thought I would add these for good measure....although not dolls as such, these antique figures did come with an old dolls house in which they had been put to good use. 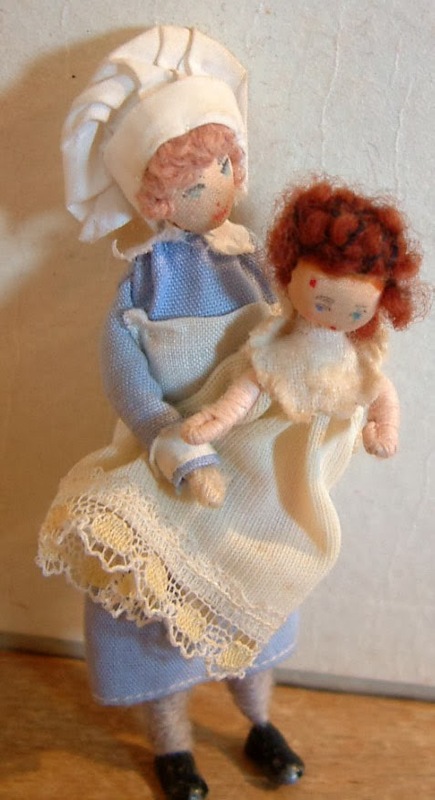 There are two bisque figures, one wearing a beautiful bonnet and the other wearing a night cap. 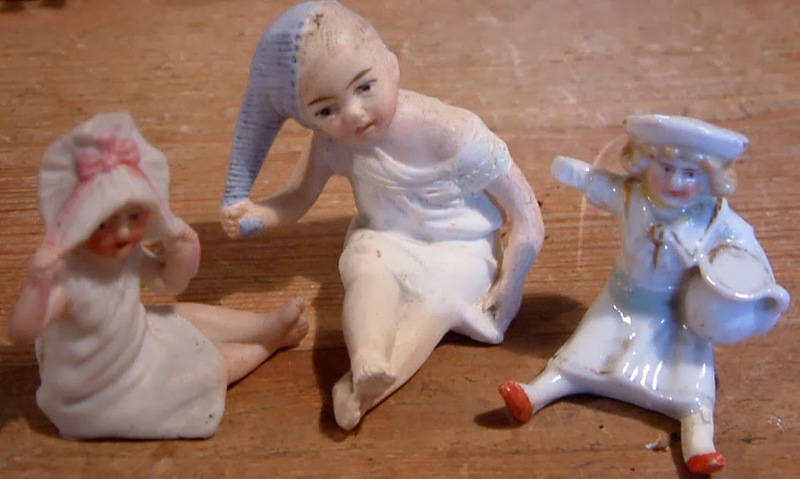 The china figure that is missing an arm, is holding a pot.